Do your energy bills seem to escalate every time the temperatures outside get hotter? During Energy Awareness Month in October, take a good look around your home. Are there any key windows that get "slammed" by the powerful rays of the sun ... so much so that the sun's powerful ultraviolet (UV) rays have entered your home and faded out carpeting and furniture? 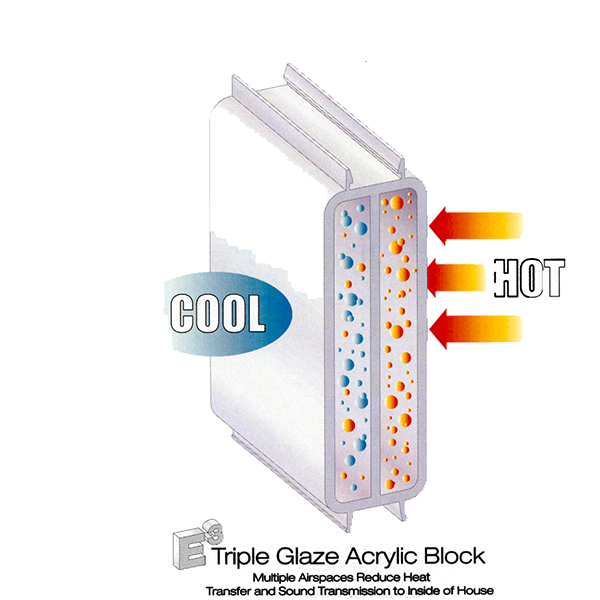 At Hy-Lite we offer three different energy efficient options for our durable acrylic block windows. These windows can actually help lower your energy bills while bringing privacy to key areas of your home. For the ultimate sun-fighting window, consider the E3 SunBlockTM PLUS window from Hy-Lite. This hard-working window combines the solar heat reduction of a SunBlock PLUS window with the insulative power of the E3 Triple Glaze window. Ideal for all climates, this is the most energy efficient acrylic block offered by Hy-Lite. By keeping the sun's rays outside where they belong, these energy-efficient window options help keep a home more comfortable. All three block windows can be ordered in either 9" x 9" x 1-1/2" or 8" x 8" x 1-1/2" block sizes.